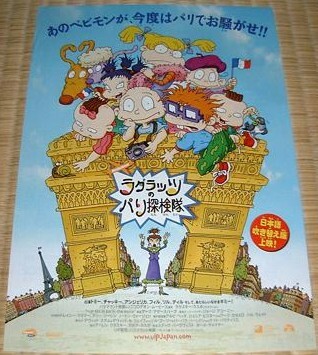 Top Above: The entire Japanese Rugrats In Paris website, from UIP Japan. According to Altavista's translation service, Kimi's box has director's info, Lil's box has the English voice information, mentioning E.G. Daily, Susan Sarandon & John Lithgow (center left), and the sentence underneath mentions that it'll be released on 4/20/2002 at theaters throughout Japan (immediate top). The film's single-page Japanese website is similar to design as the main pages of the film's websites worldwide. The Japanese release on 4/20/2002 is the latest release of this film, 17 months (almost 1.5 years) after the initial US release In November 2000, and 9 months after the last known foreign release in Brazil (July 2001). The reason why the film's release was so late in Japanese is that the show is, apparently, still not very popular in Japan, and Nick wanted to make the show more popular. Also, this film was released 2.5 years after the Japanese release of The Rugrats Movie in December 1999, slightly more than the period between the two films in the US (2 years). Left: Japanese movie poster, from eBay. Both ©2000-2002 Viacom. Special thanks to Super Yo for the version with Japanese fonts..